This is a recipe for a warm and delicious dish called "Vegetarian Chili" know you know how I HATE animal ingredients and I always love finding the best healthiest way to eat. So this is Vegetarian and PERFECT for me and you will LOVE it too. It's FILLED AND JAM PACKED with healthy things for you like.. 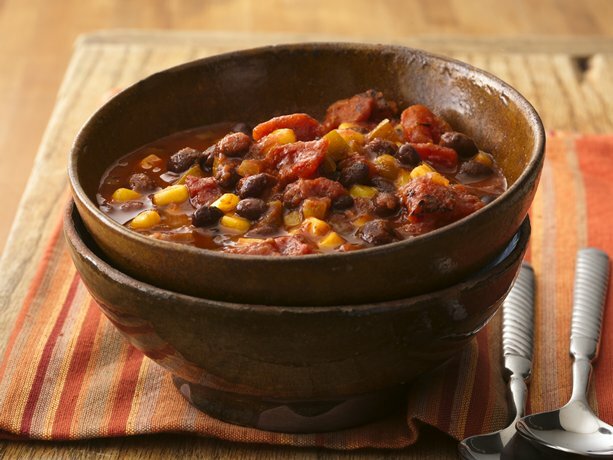 Protein, Vitamin's A 7 C, Calcium and Iron and MORE..
Cumin, chili powder and chiles add the heat to meatless chili featuring organic fire-roasted tomatoes, black beans and sweet corn. In 4-quart saucepan, heat oil over medium heat. Add onion, bell pepper, garlic and chiles; cook 5 to 7 minutes, stirring frequently, until tender. Stir in black beans, tomatoes, water, chili powder, cumin and salt. Heat to boiling. Reduce heat; cover and simmer 30 minutes, stirring occasionally. Stir in corn. Heat to boiling. Reduce heat; simmer uncovered 5 minutes longer. Top each serving with remaining ingredients. You can vary the heat level of this chili by decreasing or increasing the amount of chiles that you use. Serve this veggie chili with warm cornbread or corn tortillas.